Biography & Genealogy: Wright William Fulton, Class of 1868 (graduated 9 out of the 11): Born- August 12, 1845. Matriculated from Little Rock, Arkansas. At VMI 4 1/2 years, out 2 years, repeated sophomore year. Military Record: At VMI January 1862-February or March 1863. 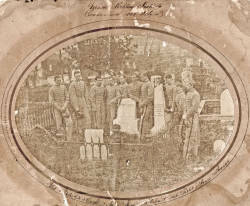 Aide-de-camp on staff of Brig Gen J.C. Tappan. Appointed 2nd Lt and Drill Master July 24, 1863 (date of rank July 18). Lt and Aide-de-camp to Brig Gen (later Maj Gen) T.J. Churchill. Unofficial source says Lt of Engineers on staff of Maj Gen J.S. Marmaduke in 1864. Unofficial source says ended war as Capt and aide to Churchill. No official record of such service found. Post War Career: Returned to VMI. To Little Rock, Arkansas (from Lafayette County, Ar) 1873. Died- July 4, 1908.